I attended my first baby shower recently. A friend of mine, being American, but having been in the UK for much of her adult life, took the opportunity when another friend got pregnant, to organise her first baby shower. This turned out to be a hilarious evening, and a great american tradition! Of course, I couldn't go empty handed, and it was quite obvious what I was going to bring ... cake! I pondered what kind of cake, and having played with my first set of cake pops not long ago, I thought, aha, baby rattles made from cake pops! Perfect. 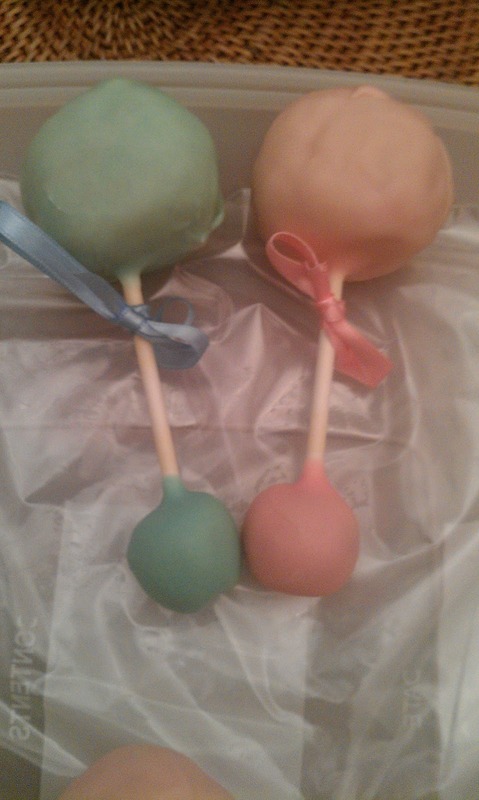 The pops were made with cookie dough at one end, and cocktail flavoured cake at the other, mmmm what a treat! I started off with my lolly sticks, these ones are 4" long and can be bought in any cake decorating store, be that an online one, or a physical one. Then I made up a set of lime flavoured sponges. Two 8" circular sponges will be plenty. I used a vanilla cake mix and added, zest and juice from a lime. 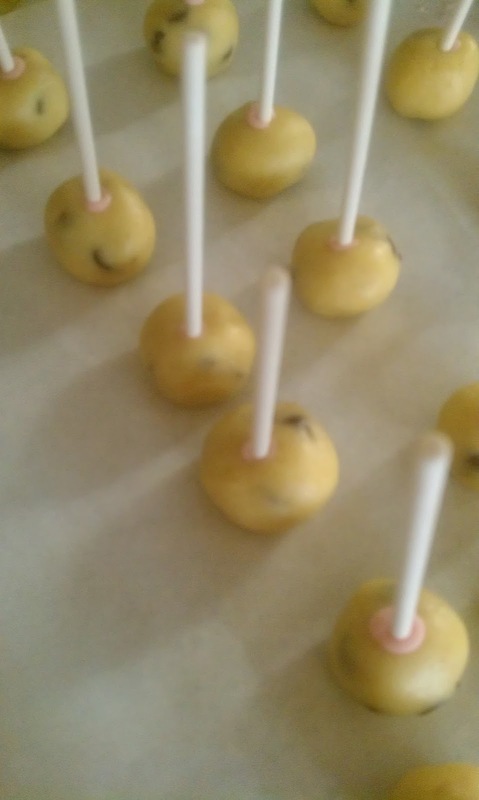 I next made a batch of egg free cookie dough, from which I made the smaller balls on the bottom of the rattles. I creamed 220 g of butter and 250 g of caster sugar in a bowl, then added a teaspoon of vanilla essence, and 300g of plain flour, and approximately 50 g of chocolate chips (the chocolate chip measurement is an estimate, I just kept adding until it looked suitably chocolatey! mmmmm) and mixed this all together to form a dough. Well who doesn't like cookie dough?? Mmmm, I know I do. I made small balls, approximately 1" in diameter out of the raw dough and set these on greaseproof paper on a tray as I went. I melted 100g of white chocolate cake covering in a bowl in the microwave, stirring every 30-40 seconds to avoid burning. A few drops of pink food colouring were added to the melt. This was then used to dip the lolly sticks into, before they were inserted into the dough balls. These were left on the baking paper on the tray for a few minutes to set. I then fully dipped half of the dough balls, up to the lolly stick in the pink chocolate, shook off the excess chocolate, before placing the lolly stick in a block of florists foam, whilst the chocolate set on the dough balls. 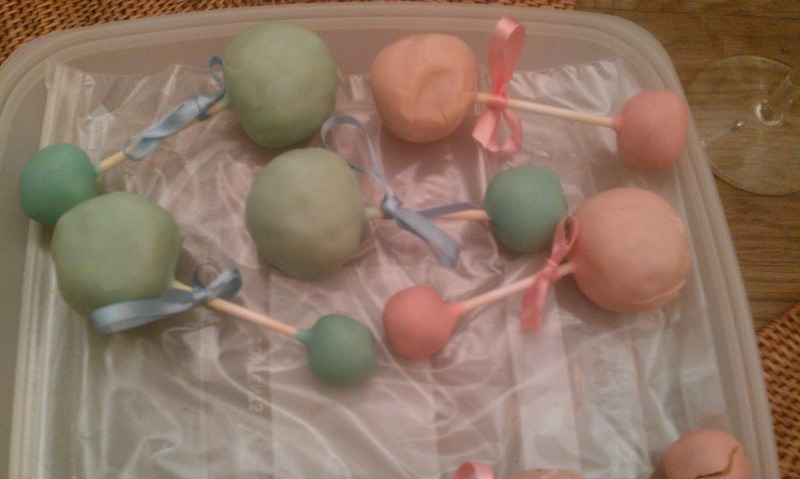 Whilst these were put aside to set, I started to make the cake pop mixture. I took one of my 8" lime sponge cakes, and crumbled it into a large bowl. For the pink pops, I made up margarita flavour cake pop balls. To achieve this I added a tablespoon of tequila, and a table spoon of triple sec to the crumbled cake. I made up a batch of lime flavoured buttercream icing, and added a little at a time, to get a mouldable cake mixture, which was not too mushy to shape. 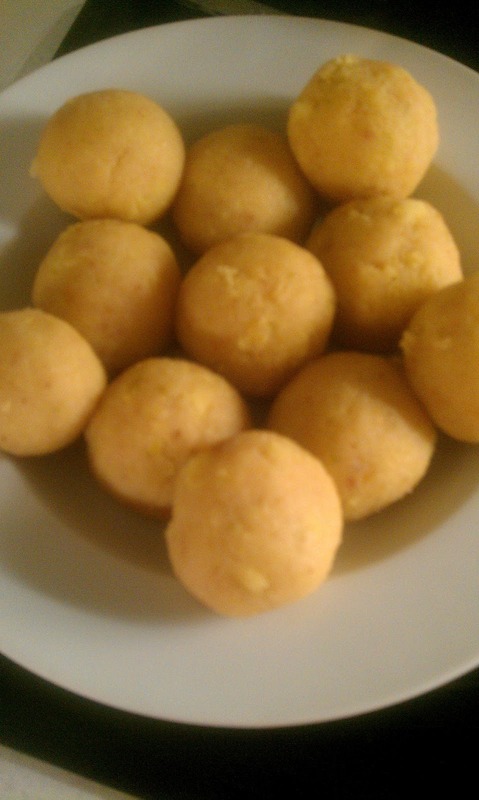 Once the mixture was made, I took small handfuls, and shaped them into balls, approximately 2 - 3 inches in diameter. 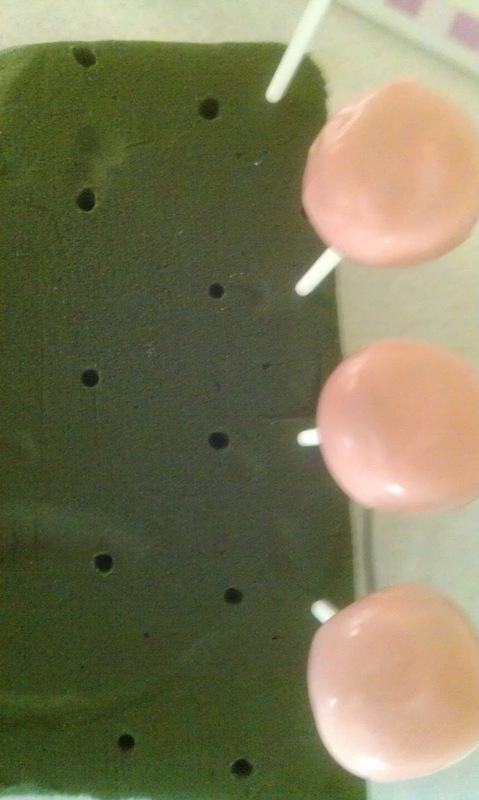 I took the lolly sticks with the dough balls on the other end, and dipped the stick into the chocolate melt, then pushed the stick into the centre of a cake ball. These were then placed on a tray and put in the freezer for approximately 5 minutes. 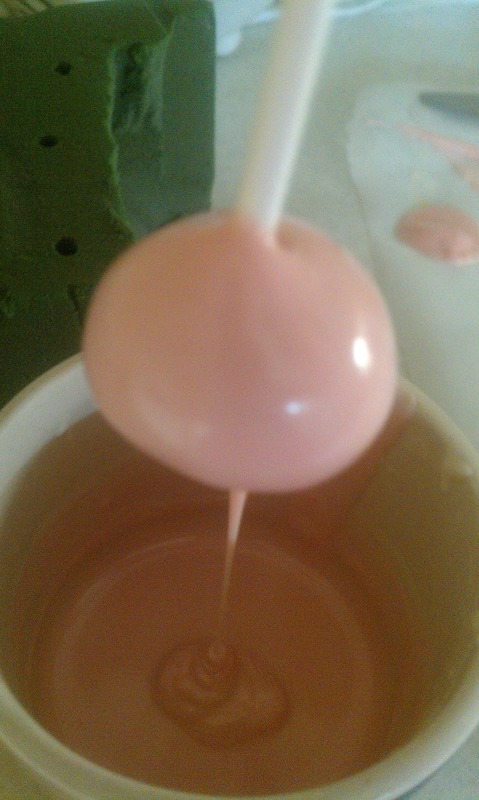 During this time I made sure the pink chocolate dipping mixture was still liquid, and if necessary you can melt some more, if you don't think there will be enough. 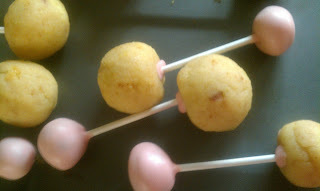 Once the 5 minutes chilling was done, they were removed from the freezer and the cake pop was fully dipped into the chocolate melt to cover. Excess chocolate was shaken off, and I held the pop aloft, until the cold cake mixture had caused the chocolate to set hard enough to put the pop back down on greaseproof paper without leaving a mark. This took almost no time at all, as the cake centre was so cold. 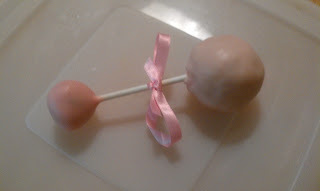 The finishing touch, was simply a thin piece of ribbon tied around the pop stick to make a bow. Lovely! Once I had finished all of the pink ones, the remaining cookie dough balls were dipped in a second batch of white chocolate cake covering dyed with blue food colouring, and this time, the cake pop was made to be daiquiri flavoured. I added a few drops of rum flavouring, and lime buttercream to the crumbled second sponge to get this flavour. All other steps were repeated as with the pink. They made a great treat, the Mum-to-be loved them, and the other ladies enjoyed them too! All in all, not a bad experiment!